The HIX HART signal isolators available in Australia from Moore Industries-Pacific have received approvals from CSA International, allowing their use in hazardous conditions. The HIX HART signal isolators have received General Location and Class I, Division 2 (Non-Incendive) approvals from CSA International in the United States and Canada. The 2-wire HIX provides superior loop isolation while allowing the HART signal to ‘pass through’ uninterrupted. HIX signal isolators provide economical solutions to three common but expensive problems that impact smart HART loops. 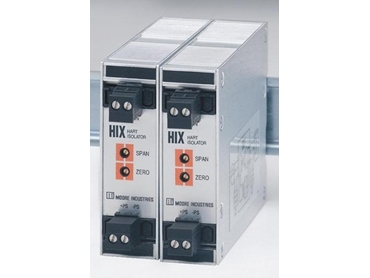 The HIX protects I/O cards from surges and spikes, provides area isolation to allow loops to continue working during system maintenance downtime and also provides a safe method of sharing a HART signal. The cCSAus certification allows HIX signal isolators to be used in hazardous environments such as petroleum refineries where flammable gas or vapours are present in the atmosphere. The approval covers Groups A, B, C and D and temperature code T4A at an ambient temperature of -20ºC to +70ºC.